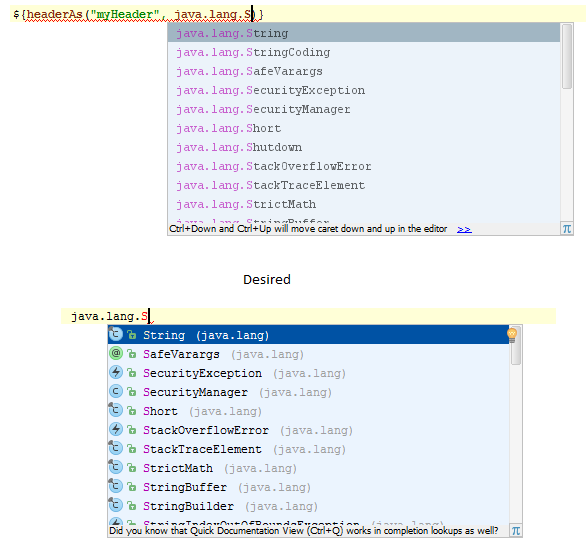 I may go for the custom approach; Is this the preferred method within IntelliJ's APIs? it depends on the custom language. If you would reuse existing references you may get more actions ready for you but some of them would break your code. So I would probably advice you to create your own reference contributors then you'll get full control over the behaviour of your plugin. Thanks for the clarification, it's much appreciated. I am currently providing my own PsiReferenceBase implementation; For providing variants I am currently using the PsiManager, DirectoryIndex and JavaDirectoryService classes to manually get both PsiPackages and PsiClasses. As such when I provide completion I get 'poor' results, and not the same sort of results you'd expect 'natively' from IntelliJ. Alan, that depends on how you construct variants. You may pass psiElement there as target object and some rendering should appear automatically. Do you need an assistance there? The PsiReference interface contains a method getVariants() which expects an array of Object, which can be either PsiElement or LookupElement. Thanks for the reply Yann, this was exactly what I needed to get going in the right direction! The one small gotcha is to remember that this text range is within/relative to your element, and not the PsiFile itself.